It's not just the congested traffic and unruly drivers which makes driving in the Philippines scary. It's also the many unprotected deep excavations and other road constructions scattered all about. I wrote about this a few months back. Look at this deep pit with nary a barrier except flimsy caution tape. Fear of falling into these crevices is palpable when driving in the crowded traffic alongside the edge. I have yet to experience such a fall but one man has and he did not escape death. What a senseless and preventable tragedy. In a separate interview, District Engineer Leslie Anthony Molina told reporters that since December last year, he has reminded the contractor to put up protective barriers or caution lines to prevent accidents in that area. “We advised them to acquire steel plates to cover the excavated manholes but the contractor said they were apprehensive of acquiring them as these might get stolen,” Molina said. When I read that I burst out in laughter. What a joke! I have heard excuses like this plenty of times. I ask why we can't get a doorbell and I am told because the children will play pranks. I ask why don't the cops just arrest those children since they found them drinking and playing with guns and I am told because they will just say the cops planted the weapons. It's always a ridiculous case scenario with no thought for safety or convenience or rule of law because the first thought is always: It might get stolen or someone might lie about it or something might go wrong. I wonder is that why these construction workers so often have no boots but only sandals? They think their boots might get stolen? This deep hole did not even have a flimsy caution tape! There was absolutely nothing to prevent this accident which means it's a miracle this guy is the only one to fall in and die. 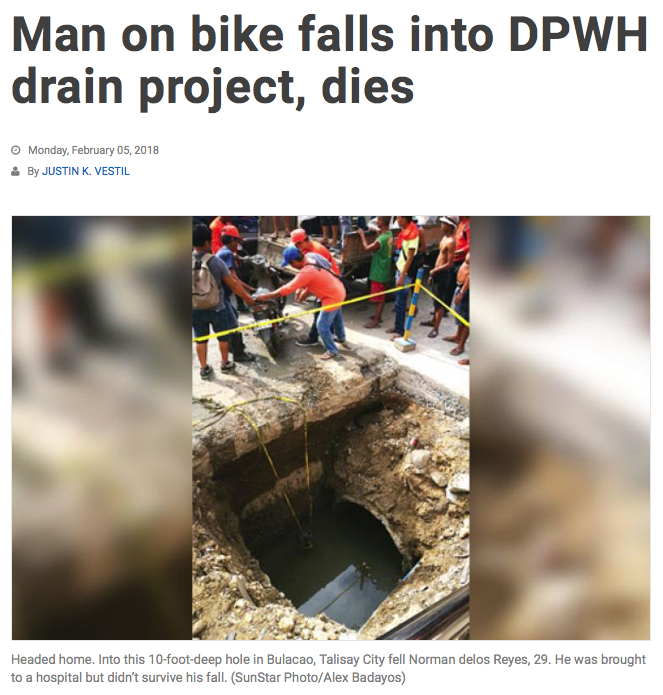 Despite the accident, Molina said that DPWH can’t sanction the contractor, who is obligated to finish the project as part of their contract. He, however, advised the contractor to assist Delos Reyes’ family with their needs, including burial assistance. Can't sanction them? Why not? This company should be sanctioned out of existence. Huge fines should be levied for each day there was no barrier and they should be criminally charged with negligence leading to death. 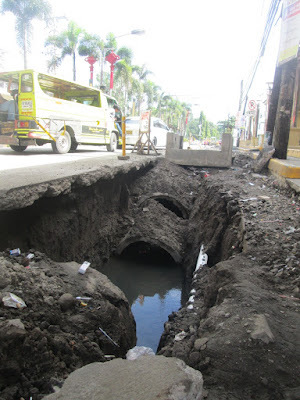 The lawyers for Cebu should find a way for the city to get out of the contract so a responsible company can be employed. If this were not the Philippines this business would be sued to the last dime by the family but this is the Philippines and the family is lucky that the company has agreed to pay funeral expenses. Of course if this were not the Philippines this outrageous tragedy would never have happened because proper safety precautions would have been followed. 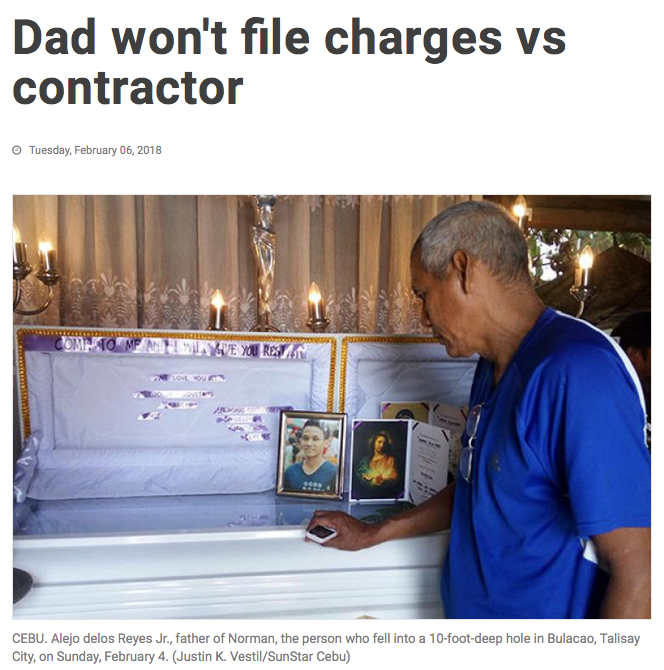 Alejo delos Reyes Jr., father of Norman, said there was no need for them to file charges against AR Adlawan Construction, as the company already committed to shoulder the funeral expenses of his son. What this family needs is a bright lawyer who is willing to assist them free of charge or for a percentage of the inevitably enormous sum this company would be forced to pay in a wrongful death suit. Stay safe out there on the roads! A responsible company? Never heard of one in the Philippines.